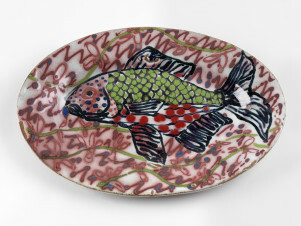 Stoneware bowl, glazed and painted with abstract black, white and blue patterns, and pink and white flowers with green stems and leaves. Thrown stoneware, reduction-fired in gas kiln. Felspathic glaze with painted and slip-trailed glaze decoration. Large Bowl with Flower Decoration, Janice Tchalenko and John Hinchcliffe, 1982, Crafts Council Collection: P308. Photo: Todd-White Art Photography. These pots were made in collaboration with the weaver John Hinchcliffe as part of an experiment to explore decorative techniques.